In 2007, the Dairyland Walkers initiated a new program aimed at eventually offering, over a number of years, an AVA sanctioned walk event in all 72 counties of Wisconsin. In 2015, we renamed this program the “Tom Doyle Walking the Counties of Wisconsin” in honor of the club member who had the vision to bring this program forward and spent considerable effort in planning walks in the northernmost area of the state. Anyone can participate in this program. To encourage participation in AVA sanctioned walking events throughout Wisconsin. Any participant paying the applicable IVV fee for award/credit or credit only is eligible to participate in this program. 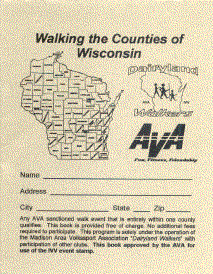 Participants must complete at least one AVA sanctioned walk event for credit in every county of Wisconsin. Any AVA sanctioned walk event that is entirely within one county qualifies. After paying the IVV fee and doing the walk, stamp the Walking the Counties of Wisconsin book, as well as your regular AVA/IVV event/distance books. If your Counties book is not available at the time you complete the event, use an insert card and attach it to the book later. Award upon completion will be a patch of the state of Wisconsin stating that you have walked all 72 counties of the state and a certificate of completion.